What would children possibly think of when they hear the word poetry? Probably of meaningful, thoughtful lines that rhyme, written and recited by a man who has seen better years. Poetry – a rather hard thing to do and understand; not too interesting for children!? Well, those children have not had the chance to meet Keith Tilbury or read his “79 Poems Of Mainly Nonesense” or his “Wozard of Iz”! When Keith Tilbury visited our primary students in year 3 and 4 you could clearly see that he had the touch for his young audience. Not only did he introduced the children to “The Wozard of Iz” by reading the first chapter but he revealed the hints the names of his main characters gave in regard to their personalities. “Diego Oscuro” (=dark) was the bad guy, brilliant at magic but not a nice person, while “Pancho Tonto” (=silly) was a really nice person but clearly not good at magic. Our guest author also gave an insight on the process of naming the mountain from “mountain of no return” to “Popotoputolu” and asked our students to make up symptoms of the kings fading health the way Keith himself had done after every chapter of “The Wozard of Iz”. Our students exhibit their creative potential and made up symptoms such as “the kings legs turn into hams”, “his eyes turn into tomatoes” or “his mouth turns into a beak”. When Keith Tilbury asked for them to write their own spell – after previously explaining them how he had worked out his spells – some students felt a little hesitant at the beginning but in the end they all enjoyed it and shared their spells with each other. 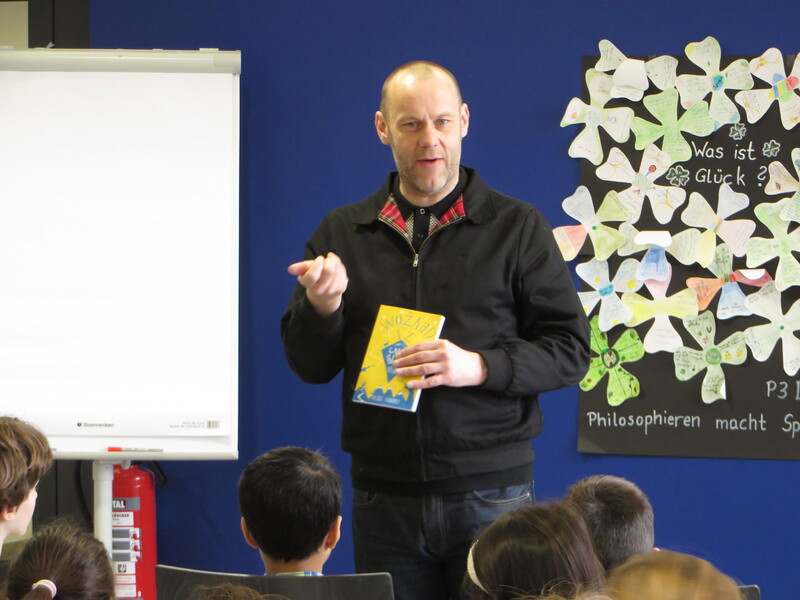 Keith Tilbury rewarded them with a very special treat: He shared some of his new an not yet released poems and asked for the children to rate them. Keith Tilbury taught everyone some essentials of writing and poetry, made it lots of fun and his reading was yet another proof that learning and having fun is not a contradiction. Oh please, dear librarian, summon a book! This is one of the poems, students in S1 wrote after Keith’s introduction. So it was not only lot of fun, but also lot of learing. Thank you so much for your visit!